Hi guys! 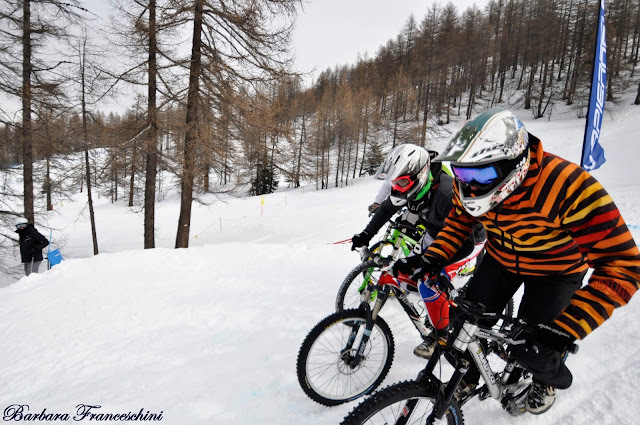 This weekend I went to Bardonecchia for a mountain bike race...on the snow!!! At the end a little video of my "trip" on the snowmobile: You can see a part of the track!!! Ciao a tutti! Domenica sono andata a Bardonecchia per vedere una gara di mountain bike...sulla neve!!! Vi lascio con qualche scatto della giornata...sappiate che ho dovuto fare una bella selezione!!! Alla fine del post c'è un piccolo video fatto durante il passaggio in motoslitta per arrivare alla partenza della gare: potete vedere parte del percorso e alcune mountain bike mentre scendono!!! le tue foto, come al solito, sono superlative! topic of this paragraph, in my view its in fact remarkable designed for me. Bentornata!belle foto ma...chissà che freddo..! bell'evento ma ssoprattutto bellissima foto tesoro! Ma che bello, chissà che fatica però! sono tutte delle belle fotografie, in particolare mi piace quella di gruppo col sole dietro, la 2. Bello andare con la motoslitta :-) scommetto che ti sei divertita un sacco!! Uno sport all'aria aperta...bellissimi scatti! Ciao. It's in point of fact a great and useful piece of information. I am happy that you shared this helpful info with us. Please keep us up to date like this. Thank you for sharing. is in fact pleasant, all be capable of simply understand it, Thanks a lot. Non sapevo che esistesse uno sport del genere sulla neve. un caro saluto. you're a professional in this subject. Well along with your permission allow me to take hold of your RSS feed to stay updated with drawing close post. Thank you 1,000,000 and please continue the rewarding work. What's up, this weekend is good designed for me, because this point in time i am reading this great educational paragraph here at my house.